Rune T. Kidde: Rock'n' roll bliver født, del 6: Fats Domino. Min signerede fotosamling. Rock'n' roll bliver født, del 6: Fats Domino. Min signerede fotosamling. 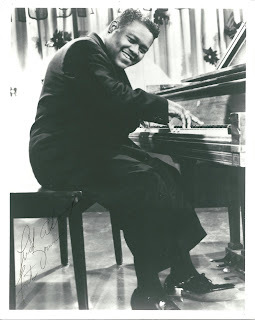 Fats Domino, alias Antoine Dominique Domino, blev født 26. februar 1928 I New Orleans, Louisiana. Brød igennem med “The Fat Man” i 1949 og er i dag 83 år gammel. Har over årene bevæget sig inden for genrerne R&B, rock and roll, piano blues og boogie-woogie. Spiller piano. 12. januar er erklæret ”Fats Domino day” i New Orleans. Fats mistede alt under orkanen Katrina i 2005, blandt andet medaljen ”National Medal of Arts”, som han havde fået af præsident Bill Clinton. Præsident George W. Bush overrakte ham en ny. Fats Dominos største hit ”Blueberry Hill” solgte over 5 millioner eksemplarer i hele verden, bare i udgivelsesåret 1956. 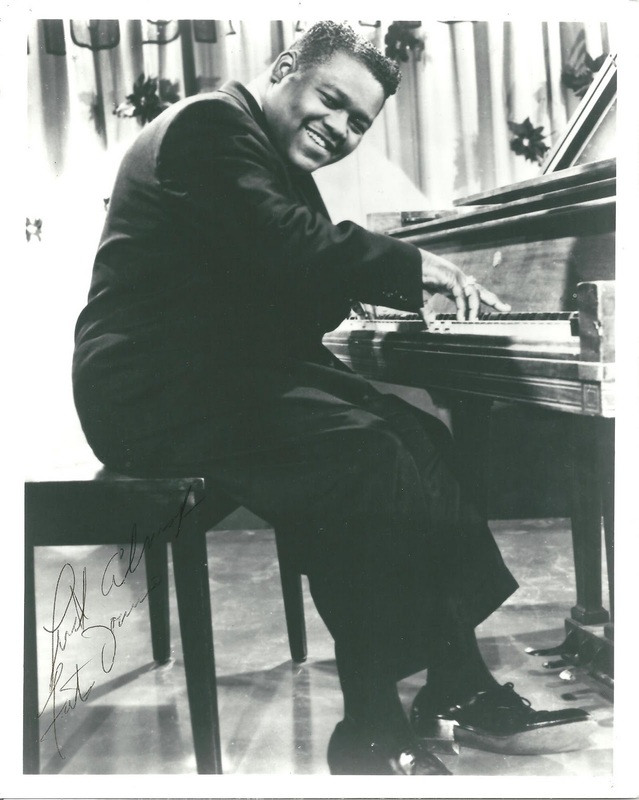 NEW ORLEANS — Fats Domino rarely emerges from his Louisiana home — and many wondered if he would show up for "The Domino Effect," his namesake concert that raises funds to help rebuild schools and playgrounds damaged by Hurricane Katrina. 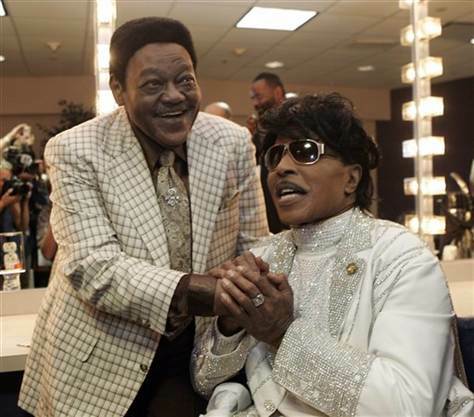 Sure enough, the 81-year-old New Orleans native smiled and waved from his private suite to more than 3,000 cheering people who attended Saturday's concert to see two of his old friends perform — Little Richard and B.B. King. Domino is an icon in New Orleans, known nearly as much for his reclusiveness as for hits like "Blueberry Hill" and "Ain't That a Shame." Little Richard, at the piano in a sparkly white suite, delivered an energetic set that included "Lucille," "Tutti Frutti" and other hits. Between songs, he reminisced about New Orleans and Domino. Richard's breakout hit "Tutti Frutti" was recorded at Cosimo Matassa's studio in New Orleans in 1955. "I was right here," Richard said, playing the piano as he talked. "I was right here." Richard said he remembered being on the road with Domino, who always longed to be back home. Then Richard broke into song: "Every night about this time, I go to sleep to keep from cryin'." While on stage, Richard was given a plaque inducting him into the Louisiana Music Hall of Fame. He said he was surprised and touched. Domino and Richard met backstage, where the men hugged, made small talk and posed for pictures. Richard's handlers handed out free inspirational pamphlets to fans during the concert, and backstage, he asked Domino and others to pray with him. Fats Domino visits with Little Richard in a dressing room after Richards' performance at The Domino Effect, a tribute concert. "Bless this life," Richard prayed, his head bowed, "and bless this music." Domino also met with King after his blues set, which included the hit, "The Thrill is Gone." As King walked off stage, Domino greeted him with a hug. "It's good to see you my friend," King told Domino. "Did you bring me some gumbo?" King said he used to open shows for Domino in the early years of his career. In 2006, King recorded the title track on a tribute album to Domino, called "Goin' Home." Saturday's concert ran more than four hours and included performances by Chuck Berry, Wyclef Jean, Keb' Mo' and Junior Brown. Comedian-actor Tracy Morgan, best known for his work on the TV shows "Saturday Night Live" and "30 Rock," also performed. Proceeds from the event are earmarked for "Operation Kids," a program run through New Orleans Saints quarterback Drew Brees' foundation to improve the city's parks and schools. Brees attended the concert with his wife, Brittany, and dozens of the couple's closest friends and family. All got to meet Domino. Slideshow: Celebrity Sightings It wasn't the first time Drew Brees met the music legend. Brees said he got to hang out at Domino's home in the New Orleans suburb of Harvey a few weeks ago. He said Domino showed him his gold record collection and played the piano. "How many people get to say they got to do that?" he said. Domino has been living in Harvey since Katrina struck in 2005, flooding his home in New Orleans' Lower 9th Ward neighborhood. Still, Domino enjoys visiting his publishing house, an extension of his old home. The studio is a classic shotgun double built in the 1930s that was rebuilt after Katrina. It is one of a few refurbished structures in the neighborhood, which still has blocks of abandoned homes and overgrown lots. Brees said he was grateful such pioneering musicians could help his foundation reach its goal of raising $1.8 million in two years to rebuild the city's parks, schools and play spaces — the things needed to bring families back to New Orleans. "These guys are legends," Brees said. "They helped define an era and build a musical genre. They're the fathers of blues and rock and roll." Pladen fra 1949 med Fats Dominos første his "The Fat Man". The Fat Man i en senere live udgave. År ikke opgivet men sandsynligvis fra omkring 1980. 1986: CBS interview med Fats Domino efter orkanen "Katrina", og en film om hans liv.